Valdangius is a small family-owned farm and winery that produces wine, extra virgin olive oil, cheese and meat. 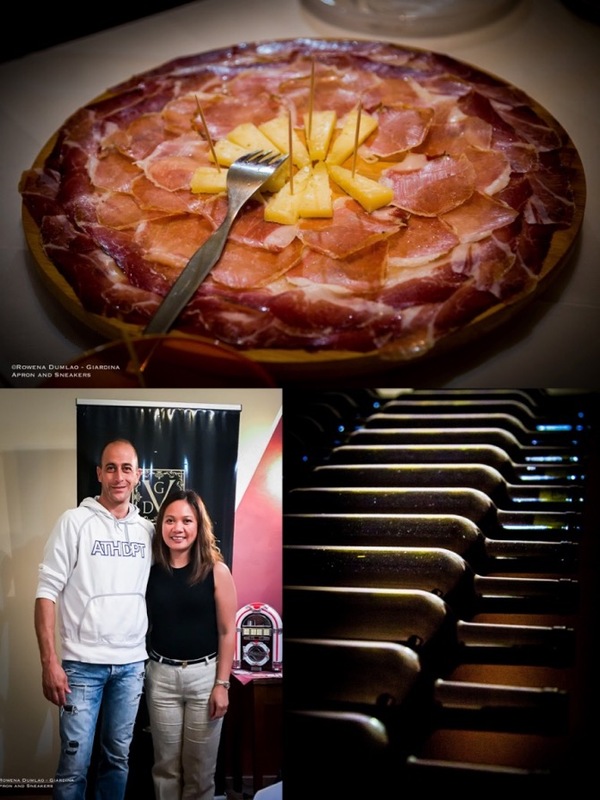 The Antonelli family has been passionate producers since the early 20th century when Danilo and Sandra's great-grandfather Giuseppe, bought the piece of land in the heart of Montefalco. The activity was assumed by Angela, Giuseppe's daughter who grew up completely immersed in the farm activities. Angela, along with her husband Fortunato, and son Giuseppe (named after his grandfather) continued what Angela's father started. Danilo and Sandra, children of Giuseppe, completely embrace the ambience that they grew up in. The siblings, now the fourth generation, decided to make things bigger with the production of quality wine and extra virgin olive oil. 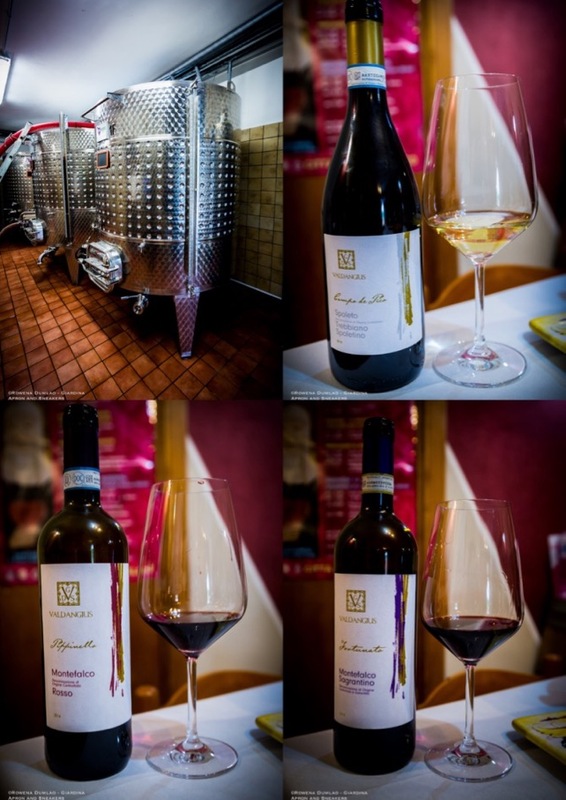 Montefalco is in their veins and taking out the best of their land fulfills their passion. The pride in their history and traditions is the soul of Valdangius. 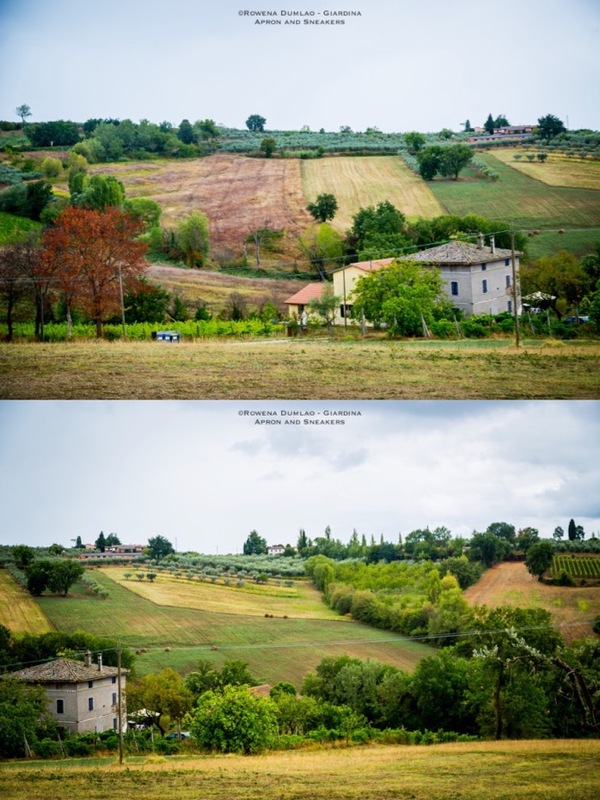 Their 15-hectare land is divided into plantations of different vines (7 hectares), olive trees (4 hectares), and the rest are dedicated to cereals and wheat that are needed for livestock that are still present in the farm. 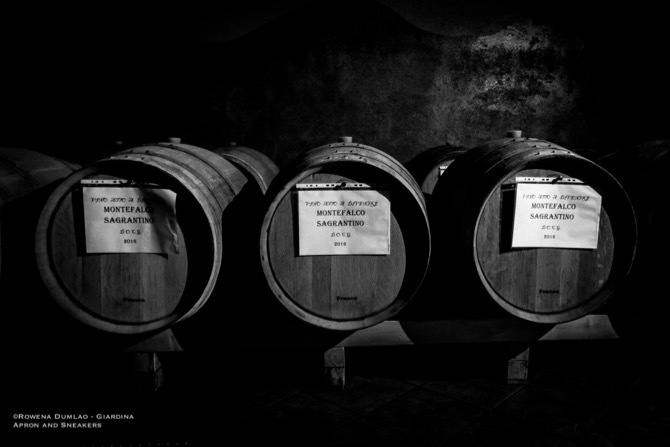 The environmental and geological characteristics of the valley of San Marco make it particularly suitable for the cultivation of vines and olive trees, resulting in the quality of products in particular of the Sagrantino, which transmits the aromas and flavors that only Montefalco's soil can produce. On a visit to Cantina Valdangius, Danilo was a very welcoming host. He spoke about their winery, their future projects, his family and most of all, their wines. 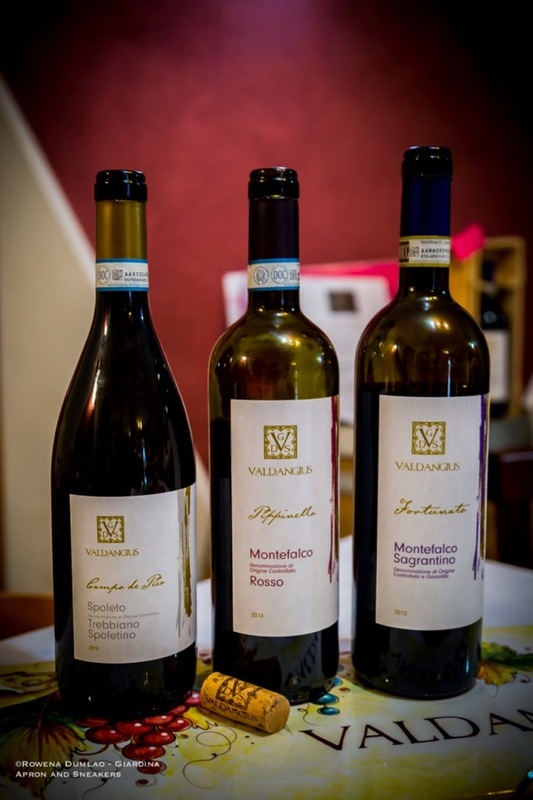 I tried three of their wines, the Campo de Pico Trebbiano Spoletino DOC 2016, the Montefalco Rosso DOC 2014 (Sangiovese, Cabernet Sauvignon, Merlot, Sagrantino), and Fortunato Sagrantino Moltefalco DOCG 2013. Trebbiano Spoletino is a white wine grape that grows in Umbria and distinctly different from the Tuscan and Abbruzzo varieties. 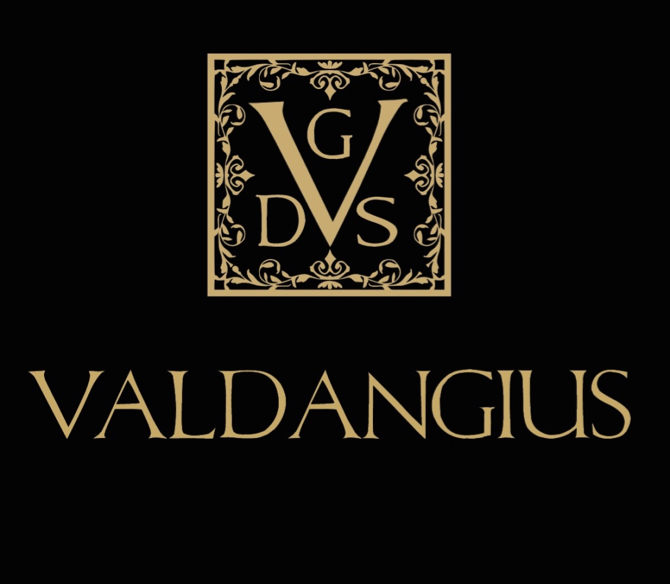 There's a growing number of producers aiming for this varietal in its pure form and Valdangius is one of them. It's also fast becoming one of my preferred white wine when vinified the ideal way that takes out its original personality. 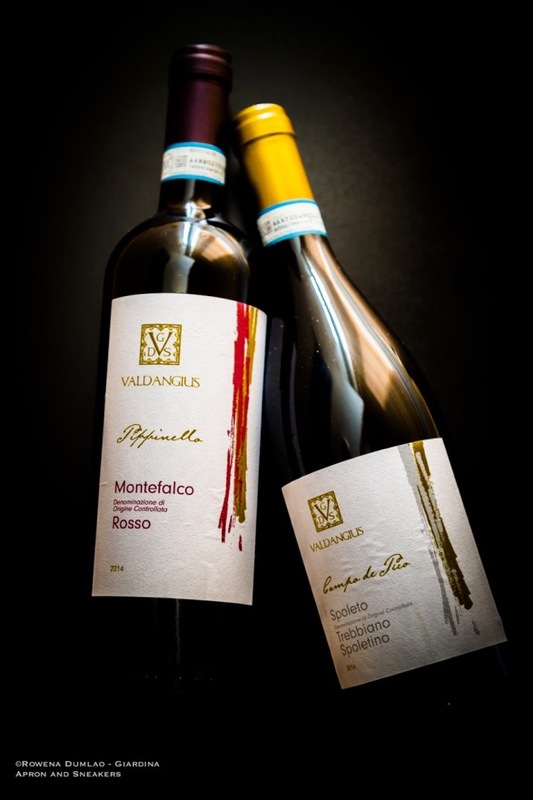 The varietal has a very pleasant aromatic profile and determined freshness like the one of Valdangius. Harvested by hand from 6-year old vines, 24-hour cryomaceration to preserve the aromas of the grapes, 6 months in stainless steel then 3 months in the bottle. Montefalco Rosso DOC 2014 has an intense ruby red color with aromas of ripe cherries, plums and spices with medium tannins and the right smoothness. After the assemblage, the wine was aged in old French barrique for 6 months, another 12 months in stainless steel then 3 months in the bottle. Fortunato Sagrantino Montefalco DOCG 2013 has an intense ruby color with a complex nose, nuances of vanilla, ripe dark fruits and spices with distinct tannins and a lovely smoothness to the palate. Aged in French barrique for 12 months, 18 months in stainless steel and 6 months in the bottle. Così il benessere della dieta mediterranea, fondendosi con i sapori e gli odori delle colline umbre, vi farà sentire tutto l'amore con cui produciamo i nostri vini e il nostro olio. The well-being of the Mediterranean diet, fused with the flavors and aromas of the Umbrian hills, will make you feel all the love with which we produce our wines and our oil.